A new initiative by the Mobility Scheme is offering wheelchair users the option to include a lightweight manual wheelchair when leasing their car through the scheme, with the new option providing increased mobility to wheelchair users when they arrive at their destination, says the charity. 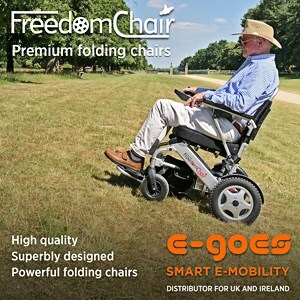 Available to anyone placing a new application for a car, the new option includes a one-off, upfront payment of £100 and offers customers the choice between the Van os Medical Excel G Logic and the Karma Ergo Lite 2 – both available as either self-propelled, for those who wish to travel independently, or assistant-propelled, which requires someone to push the wheelchair. According to Motability, the lightweight manual wheelchairs can be ordered via a car dealership at the same time as ordering a Scheme car, with the two available wheelchairs selected because of their lightweight and easy to fold design, allowing for easy transportation in customers’ Motability vehicles. As with all products leased through the Motability Scheme, the lightweight manual wheelchair is fully supported throughout the lease scheme, allowing those who receive the Enhanced Rate of the Mobility Component of Personal Independence Payment, the Higher Rate Mobility Component of the Disability Living Allowance, War Pensioners’ Mobility Supplement or Armed Forces Independence Payment to exchange their mobility allowance to lease a new car through the Motability Scheme.